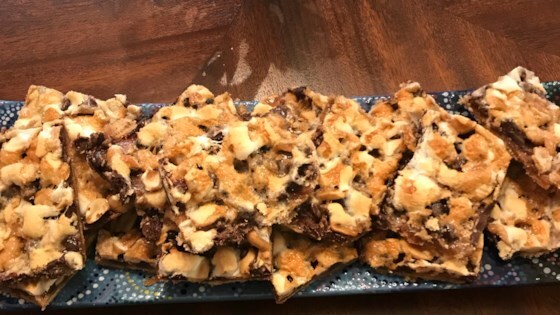 "My daughter used to make this when she was little"
Arrange graham crackers to cover the entire bottom of a 15x10 inch pan. Sprinkle marshmallows, chocolate chips, and peanuts over the graham crackers. In a small saucepan, cook the butter and brown sugar until dissolved. Remove from heat and add vanilla. Pour evenly over the ingredients in the pan. Bake for 10 to 12 minutes in the preheated oven. Store in the refrigerator for 3 days or the freezer for 1 month. Tasty, 5-ingredient, rocky road popcorn balls! My friends and I seriously ate these within fifteen minutes. I should have made more! This recipe was easy enough, but I am a little disappointed in how it looks. It is not thick enough to cut into squares so I am not quite sure how to serve it. Delicious. Not too attractive, but they make up for it in flavor!!! Thanks. this was a super super snack. Very easy and yummy. My neighbors loved it and requested the recipe! I served these at my last Longaberger party, and everyone loved them! Thanks for sharing this recipe!